Dogs go through a few different sensitive periods during their lifetime, when it comes to their physical and behavioral development. Some of these periods are quite important, due to the impact they’ll have on the dog’s personality and behavioral health. We can identify nine different phases; in this article, we’ll discuss some of the particularities of each of them. The first phase is the fetal period. This includes the development of the fetus up to parturition. 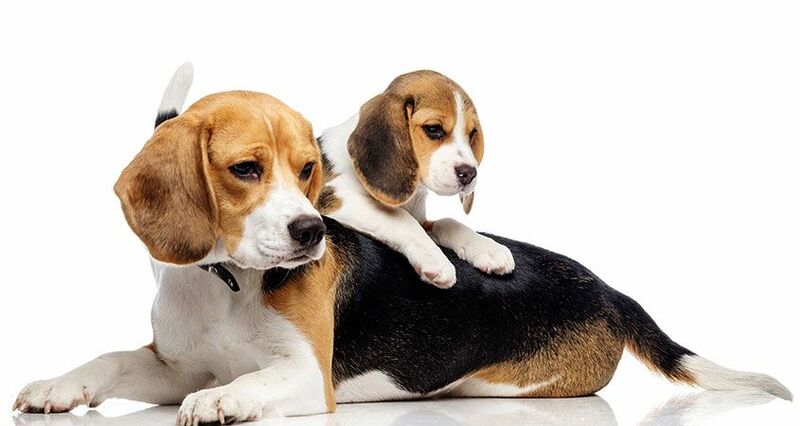 During this period, the puppy will be influenced by the mother’s experiences. If she’s exposed to high levels of stress, the puppies will be prone to develop anxiety and fear. It is also during the fetal period that the male’s brains will go through a masculinization process, due to the production of testosterone. This will make them more likely to exhibit typical male behaviors such as urine marking, roaming, inter-male aggression and male sexual behavior. The second phase is the neonatal period. This period extends over the first ten days of the puppy’s life; he is blind, deaf and unable to control his body temperature. He is attracted to warmth and will move towards his mother’s teat. Human contact is important and, to do so, the puppy should be held and touched; he can also be placed on a cooler surface, for about 30 seconds. This will help him to better cope with stress, be more trainable and emotionally stable throughout life. The third phase is the transition period. It follows the neonatal period and reaches to about 3 weeks of age. This is a phase of intense development. The puppy begins to hear, see and control his body temperature. During this time, we should offer him the chance to eliminate away from his sleeping area. He should be handled, allowed to interact with toys and exposed to different sounds and stimuli, during small periods of time. He may also begin to eat solid food. The fourth phase, the socialization period, is extremely important. It extends from 3 weeks to 12 weeks. The puppy can be taken away from his mother and siblings at 8 weeks old and adopted by a human family. During this phase, he should be exposed to a considerable amount of stimuli. This exposure should be done in a positive, gradual and controlled manner, so the puppy doesn’t get any traumas whatsoever. He should be exposed to sounds, surfaces, animals, people and objects: cars, hair driers, skaters, toddlers, men and women, people wearing a hat, people wearing sunglasses, motorcycles, vacuum cleaners… Simply put, he should be socialized to the things he may encounter on the future. If he’s correctly socialized, he will be less likely to be fearful and, as a consequence, aggressive towards unfamiliar stimuli. The fifth phase is the fear period. It lies within the socialization period, since it starts at 8 weeks of age, and can last about 2 weeks. It’s characterized by increased fearfulness and likely permanent retention of the fear reaction. If the puppy experiences any traumatizing situation during this particular period of time, he may exhibit fearful and aggressive behaviors towards it during his whole life. The sixth phase is the juvenile period. This ends with puberty, which will vary according to the dog’s breed and size. 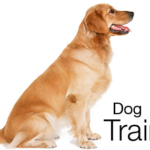 The physical growth rapidly increases and the dog becomes more energetic, excitable and independent. Just like a human adolescent, the dog may act more “rebellious”. Suddenly, the puppy discovers a whole new world of stimuli and it’s way more interesting than his owner! We need to be a bit more patient during this phase and work harder on providing him with enough training and mental stimulation. The seventh phase is the adolescent period. It will begin with puberty and end when the dog reaches social maturity. The degree of social maturity attained will depend on the dog’s breed. Herd-guarding dogs remain very puppyish and immature, whilst terriers, for example, will be relatively more mature. If the breed is socially immature, the dog will be less predatory, more playful and more prone to enjoy physical contact. During this phase, some of the pre-existing behavioral problems may become worse. The eighth phase is the adult phase. Dogs will become socially mature at about 2 to 3 years of age, depending on the breed’s size. 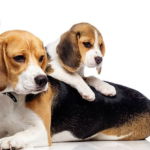 Dogs may tend to exhibit calmer behaviors, less playful activity and less tolerance towards new dogs and stimuli. Within multidog households, the social dynamics may change: the dogs may start to fight over resources, since the new socially mature dog may decide to challenge an older dog’s access to the available resources. The final period, the senior phase, will begin when the dog reaches 75% of his lifespan, which is usually around 7 years of age. 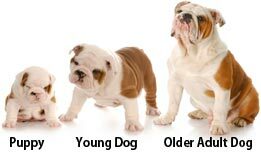 Although small dogs tend to live longer, all dogs will eventually experience the consequences of an older age. Besides the health problems (such as heart and kidney failure, muscle atrophy, thermoregulation issues, cancer, oral disease, amongst others), senior dogs may suffer from cognitive dysfunction syndrome. This disease is similar to Alzheimer’s in humans and, as a consequence, the dog may begin to lose his memory and fail to recognize familiar people and objects. He may also start to act aggressively towards stimuli that he once tolerated. Training, mental stimulation techniques and adequate nutrition can be vital to help minimize these problems.